Similar to just about any agricultural enterprise, very little in beekeeping is agreed upon by every beekeeper. One thing they do agree with at this time of year is to check honeybee colony health and to get those bees that survived a rough Illinois winter off to a strong start. Bees cluster in hives during the winter. As temperatures drop, bee clusters get tighter to keep warm and they move around the colony eating stored honey. Even though Krengel tried protecting four of his honey bee colonies with a newer type of insulation this winter, those were among the ones he lost. He notes several factors other than temperature can have an impact on bee colony survival in Illinois. 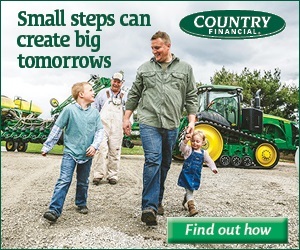 “Even now, when we’re only a month away from the first good forage, there are still some colonies that will not make that last month,” he says. While awaiting more sources of pollen and nectar for bees, Krengel, who manages up to 30 hives a year, and many other Illinois beekeepers have begun moving Mother Nature along by placing sugar water at the tops of their wooden hives. Krengel sells his honey at some delicatessens and health food stores in McHenry County. He offers a few tips on how he believes you can tell the difference between high and mediocre-quality honey. 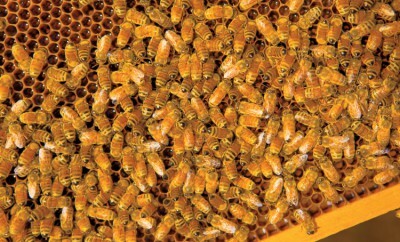 A queen bee can lay 2-3,000 eggs a day. As they begin emerging three weeks later, the population of the colony can increase by more than 2,000 bees daily. Starting a little over a decade ago, some beekeepers have experienced Colony Collapse Disorder (CCD). The U.S. Environmental Protection Agency says CCD occurs as a result of several factors, including an invasive varroa mite, viruses, pesticides, stress caused by transporting commercial hives and inadequate or changes to forages. Krengel and other Illinois beekeepers want to see this when they open a colony for the first time in spring. 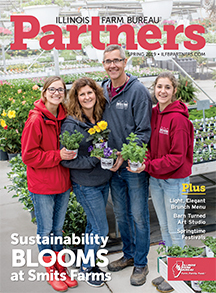 “Strong colonies in April foretells good pollination and a good honey crop later,” Krengel says. 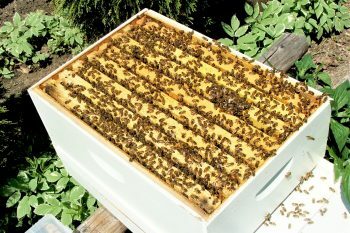 Will County, with more than 2,300 registered colonies of bees, has the most with Lake and Cook counties rounding out the top three. Krengel raises queen bees too as they are often marked representing the year they were raised. 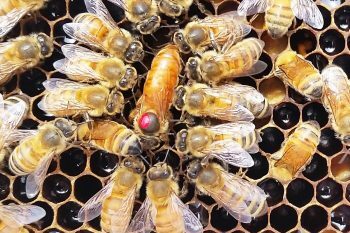 In 2018, red helped identify queens, and Krengel said this year, green will be used. When a queen is surrounded by her “court” as they are here, Krengel said it’s a sign the workforce is happy with her. 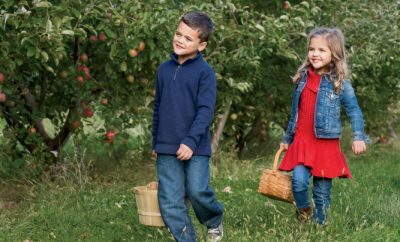 Illinois specialty-crop farmers rely on bees to pollinate crops they grow in the state such as apples, blueberries, cucumbers and pumpkins. Krengel, who also hosted teachers participating in his county Farm Bureau’s Summer Ag Institute last year, notes most bee breeding in the United States takes place in Georgia, northern California and Hawaii. 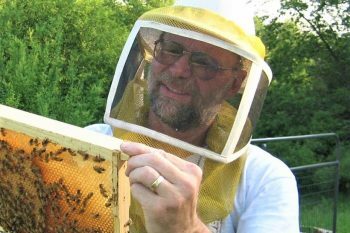 He believes small, local beekeeping could prevent problems caused by a narrowing bee gene pool. To learn more about beekeeping in Illinois, visit the Illinois State Beekeepers Association website.